Our view at Villa Jessica, found on airbnb in Sala Comacina. Breakfast each morning da me, Cornetti con marmellata from the local grocery store bakery, italian peaches are the best you will ever eat, blood orange juice, doppio espresso lungo and eggs with Prosciutto di San Daniele. Per-fect. Since I have absolutely no time off as a new employee, we are using every holiday weekend available to plan our travels. Milan is one of the cheapest options, with frequent hour-long flights direct from Stuttgart. The airline had a package deal, so we ended up booking two roundtrip flights plus a rental car for four days, for less than $150 total for both of us. 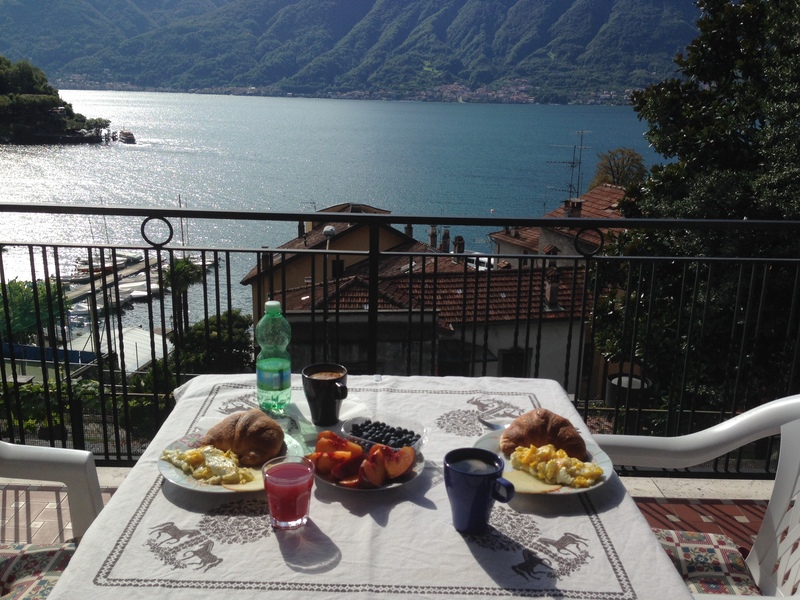 The original plan was to split the time in Milan and Como, but after the threat of cold weather seemed to becoming more real, we changed the plan and stayed the whole weekend in Lake Como for one last trip with sun. We found a last-minute airbnb apartment with a view in Sala Comacina. Having a car in this area was a must have, thankfully we had one booked. Next time, we’ll try another town with more walking nearby. We got great advice from our neighbor who works in textiles and travels to Milan every few weeks for work. 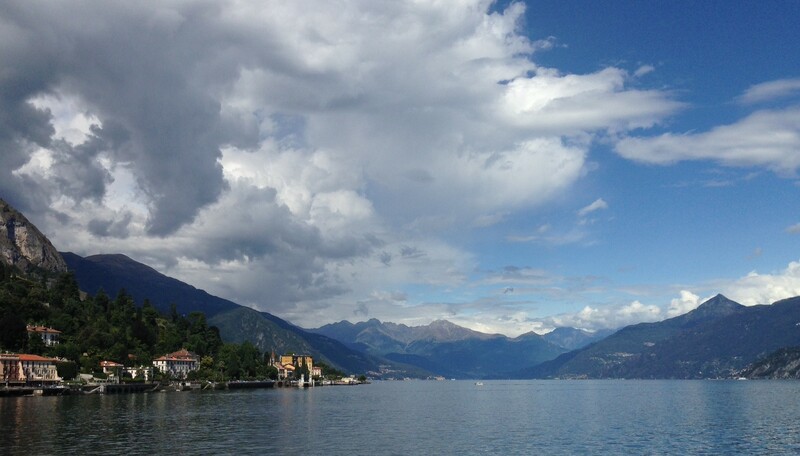 Cernobbio was one of his favorite areas where Villa D’Este, Harry;s Bar and Il Gatto Nero restaurants are plus a cute shopping street, and of course amazing views on the lake. We drove to the ferry stop and took the boat over to Bellagio. There are several boat hubs every few miles around the lake called, Navigazione Lago di Como and they run about every 30 minutes or so. Bellagio is a hillside town, cute to walk around and grab a glass of wine for the afternoon. Too expensive and touristy to shop but some good pictures and of course gelato. View of Bellagio from the ferry-boat. Dinner service in Italy begins at 7 p.m., something we forgot when looking for dinner options at around 6 p.m. on a Saturday but we wound up at some of the best local spots by chance. 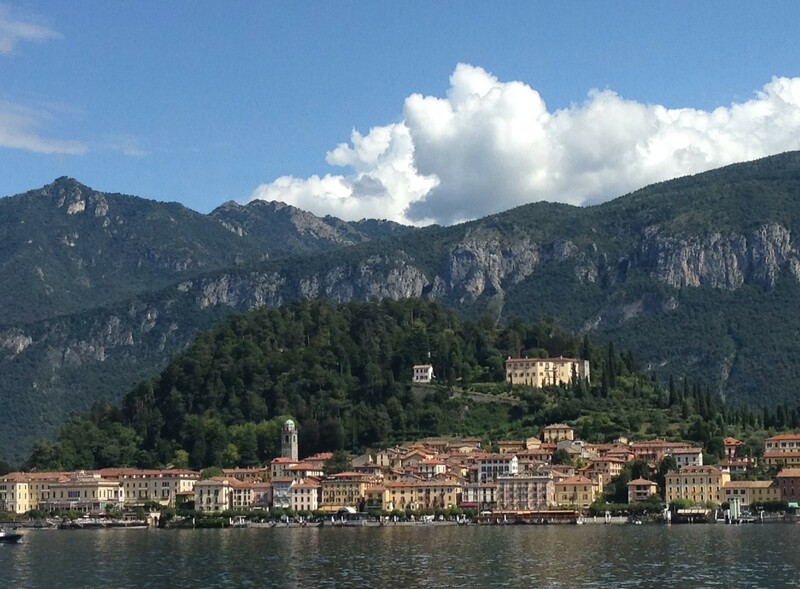 Driving the 40+ minutes through the narrow winding roads of Lake Como to the northern town of Menaggio is not as far of a drive when there is so much to see along the way. 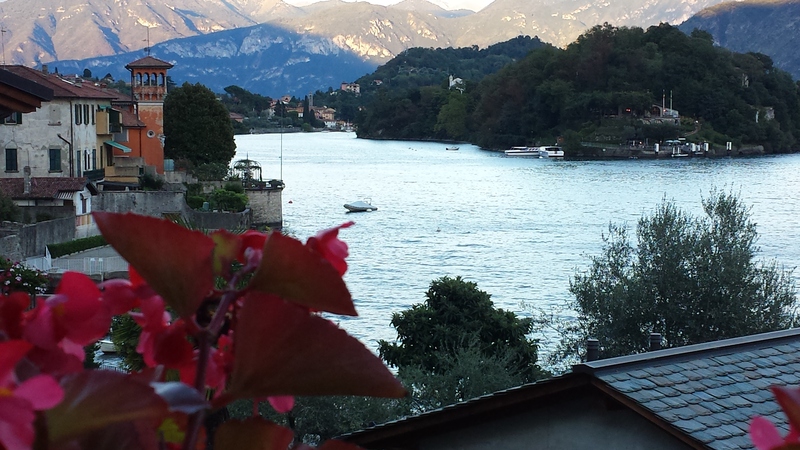 Passing through all the tiny lakeview towns like the famous Tremezzo, looking at all the villa/mansions and the mountains on the way we ended in Maggiano for dinner at Osteria il Pozzo (the well) just off the piazza. Homemade pumpkin ravioli…say no more. The next day, driving the other direction from Sala Comacina where we stayed, south, again through the narrow winding roads to the center of Como, it was about 40 minutes drive. Again beautiful the whole way. The center of Como is a mix of medieval history in the old part of town, shopping, historic war monuments along the park on the water, and hotels. You can’t miss the Duomo di Como or Cattedrale di Santa Maria Assunta. Only a minutes walk from the bottom of Como, through the piazza is the huge cathedral. Entry is free. The area around the church is filled with shops and restaurants. 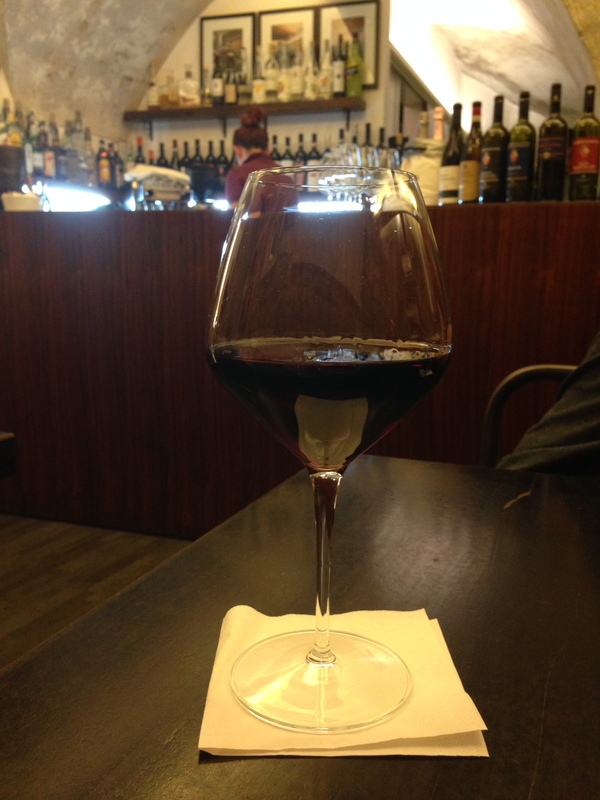 In an effort to get away from the more touristy areas for lunch – i.e the street with Macdonald’s, we headed back toward the medieval street and found another osteria, Osteria del Gallo (Gallo=chicken). We asked (in Italian) for a menu, but this place doesn’t offer one, they change daily depending on what they have locally and offer 4 or 5 things. Love it. We both of course got different pastas, again. I’m sure we drove the full side of the lake during our weekend stay. We stopped in tons of towns to walk around too. Argegno was one of our lesser favorite towns, although it was cute to look at, because of the tourist factor – the waiters spoke English to everyone no matter where they were from, and the price for a house wine was triple compared to any other towns along the lake – even the fancier hotels. 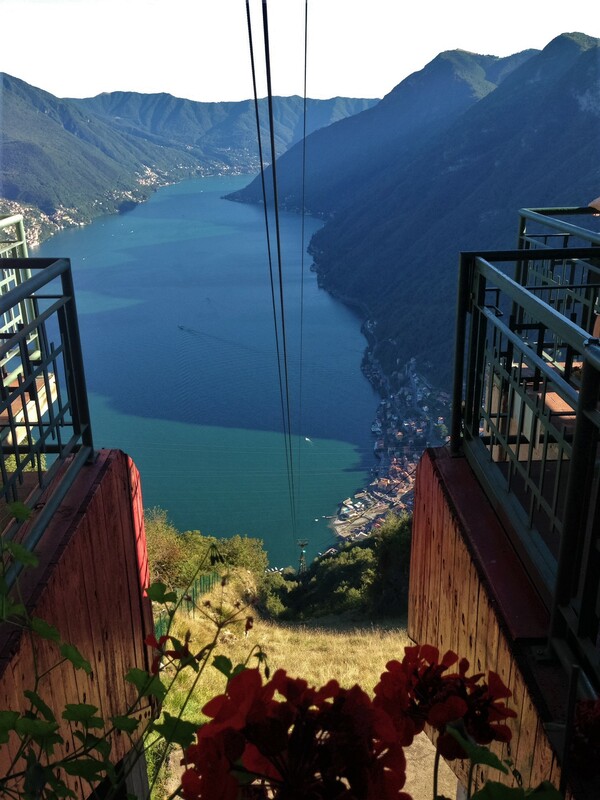 However, the best find from stopping there, we recommend to all, is the Argegno-Pigra cable car. Return trip is 4.50 euros per person and you can see the entire lake from the top of the mountain. If you are at all afraid of heights, put on a blindfold before going up or down because this cable runs almost vertically, straight up the mountain. There are hiking trails mapped also. Because it was the end of the day, we did the 20 minute one to the other peak nearby for another amazing view of the northern part of the lake where it splits from italy to Switzerland.